I used a light green base and then used neon pink and orange to dry brush around the edges so that it looks a bit like the suicide squad colours. 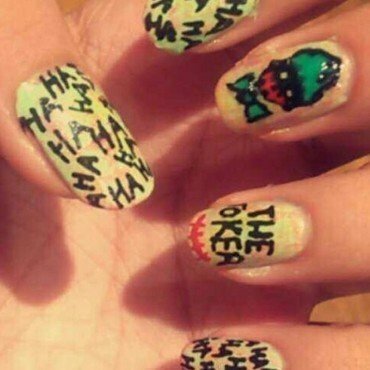 I used a black nail art pen to write 'HA' repeatedly on my thumb, index and pinkie nails and used the same pen to write 'THE JOKER' on the ring finger. Then I used a striping brush dipped in Maybelline Candy Apple to draw the Joker's mouth. For the middle finger I used my black nail art pen to draw a silhouette of a head (which does not need to be perfect), leaving two holes for eyes. I used glow in the dark nail paint for the hair and bow tie so I first created the shapes in white so that the glow in the dark polish is actually able to glow in the dark and outlined the bow tie with the black pen. Then I used the same red polish to draw the Joker's mouth again. After, I sealed all the nails with a quick drying top coat.